Presented with permission through Music Theatre International (MTI). Six young people in the throes of puberty, overseen by grown-ups who barely managed to escape childhood themselves, learn that winning isn't everything and that losing doesn't necessarily make you a loser. 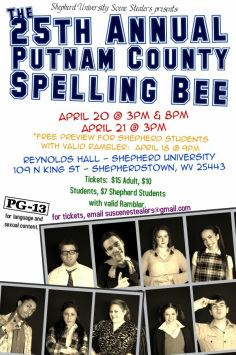 THE 25TH ANNUAL PUTNAM COUNTY SPELLING BEE is a hilarious tale of overachievers' angst chronicling the experience of six adolescent outsiders vying for the spelling championship of a lifetime. The show's Tony Award winning creative team has created the unlikeliest of hit musicals about the unlikeliest of heroes: a quirky yet charming cast of outsiders for whom a spelling bee is the one place where they can stand out and fit in at the same time. "Such a fun show! Every single member of the cast (and pit and crew) did an AMAZING job! Thanks for brightening my Sunday afternoon!" "It was a great show! LOVED the characters! . . . and your voices . . . amazing! Very glad we came."